Epigenetic regulation, including histone modifications, DNA modifications, and non-coding RNAs, plays crucial roles in both embryonic and adult neurogenesis . The most recently discovered regulatory modification, N6-methyladenosine (m6A), is a highly abundant, so-called epitranscriptomic mark found in mRNAs [2, 3]. Similar to DNA and protein modifications, m6A in mRNA is reversible and thus open to dynamic regulation [4, 5]. Levels of RNA methylation are finely balanced through an interplay among m6A methyltransferases (writers), demethylases (erasers), and binding proteins (readers) . m6A has been shown to regulate RNA processing, including RNA splicing [7, 8], nuclear export , RNA degradation [10, 11], and translation [12–14]. In agreement with its functions in RNA metabolism, m6A is an important regulatory factor in different cellular processes, including heat shock response , DNA damage response , cell fate determination [16–19], and innate immunity . In addition to its functions in these cellular processes, in vivo studies in model organisms have revealed crucial roles of m6A in spermatogenesis [9, 21–23], embryogenesis [24, 25], and T-cell homeostasis . Although m6A is abundant in the brain, its dynamic regulation and biological significance for brain development remain largely unknown . Among the m6A-related genes identified, the RNA demethylase FTO is proven to be crucial for various brain functions, including D2R-D3R-GIRK-mediated signaling , adult neurogenesis , and memory formation [29, 30]. A recent report confirms the role of m6A methylation in temporal progression of mammalian cortical neurogenesis and in regulating axon regeneration in the adult mammalian nervous system [31, 32]. To better understand the underlying mechanisms responsible for the temporal and spatial complexity of the brain, it is important to characterize the physiological functions of m6A in a context-dependent manner. However, the biological functions of other m6A-related genes in different brain regions remain unclear. The cerebellum consists of a multi-layered structure, rendering it an important model for the study of neuronal cell proliferation, migration, and differentiation . Considerable progress has been made in identifying the epigenetic mechanisms responsible for cerebellar development, such as DNA 5-hydroxymethylation  and chromatin accessibility . Interestingly, the cerebellum of Fto-deficient mouse was found to be smaller than that of wild-type mouse ; however, mechanisms responsible for this growth defect remain unclear. In agreement with the spatial and temporal regulation in the brain, cerebellum-specific methylation has been identified . Despite these findings, the precise role of RNA methylation in the cerebellum and its temporal control during postnatal mouse cerebellar development still await elucidation. Here we investigated the dynamic regulation of m6A in the developing mouse cerebellum and determined its biological significance by disturbing the expression of the m6A writer METTL3 or the m6A eraser ALKBH5 in mice exposed to hypobaric hypoxia. This study uncovered that the temporal regulation of RNA m6A methylation is essential for precise control of postnatal cerebellar development. To understand the biological impact of m6A in mouse cerebellum, we first performed m6A analysis using postnatal cerebella at day 7 (P7), P14, P21, and P60 (Additional file 1: Table S1). We identified 10,449, 10,266, 10,419, and 10,783 methylated poly(A) RNAs at the four stages, respectively (Additional file 1: Table S2, Additional file 1: Figure S1a–c). Data analysis showed that UGGACU was the most conserved consensus sequence among all m6A peaks (Additional file 1: Figure S1d). Distribution analysis of all the m6A peaks in mRNAs revealed that their methylation patterns were similar from P7 to P60 (Additional file 1: Figure S1e). Intriguingly, we observed significant enrichment of m6A peaks in start codon regions in addition to the coding sequence (CDS) and stop codon regions. A statistical analysis of the m6A peaks located in different transcript segments showed that the proportion of m6A peaks in start codon regions increased gradually from P7 to P60 (Additional file 1: Figure S1f and Additional file 1: Table S3). To explore how m6A changes in postnatal mouse cerebellum, m6A peaks were subjected to pairwise comparison between each two adjacent stages. In total, we identified 12,452 “ON” switches (emerging m6A peaks in the later stage) and 11,192 “OFF” switches (resolving m6A peaks from the former to the later stage) (P < 0.05, enrichment score > 1.5) during the postnatal development (Fig. 1a, b and Additional file 1: Figure S1g). The m6A ON and OFF switches also exhibited apparent differences in their distribution patterns. The m6A ON switches were more likely to be enriched in start codon regions rather than stop codon regions. In contrast, the numbers of m6A OFF switches surrounding stop codon regions were higher than that of ON switches (Fig. 1c and Additional file 1: Figure S1h). Together, these data imply that m6A marks occurring at earlier or later stages of cerebellar development have different preferences with regard to their distribution along with the whole mRNA transcripts. To evaluate the biological significance of genes with dynamic RNA m6A modification, we next performed Gene Ontology (GO) analysis for those genes with ON/OFF switches (Additional file 2: Table S4). The genes with different types of switches appeared to possess different functions. For example, the genes containing P7–P14 OFF switches were mostly annotated to biological processes such as cell cycle, cell division, and DNA repair (Fig. 1d). In contrast, the newly occurring methylation at P14, P21, and P60 represented by the ON switches was detected in many genes involved in signal transduction, cell adhesion, learning, and synaptic plasticity (Fig. 1e). Together, these data confirm that extensive RNA methylation and demethylation occur over the course of neuronal differentiation in vivo, in both proliferating and fully differentiated neural cells. Moreover, the distinct functions of genes containing m6A OFF or ON switches suggest that m6A is a prerequisite for those genes to exert their functions at each developmental stage. As m6A is developmentally regulated in mouse cerebella, we next analyzed the methylation profiles over the four postnatal stages. We found 8367 continuously methylated RNAs (CMRs) throughout cerebellar development, together with 634, 260, 315, and 512 specifically methylated RNAs (SMRs) at P7, P14, P21, and P60, respectively (Fig. 2a, b and Additional file 1: Figure S2a). We then investigated whether the SMRs and CMRs possessed different features in their methylation during postnatal cerebellar development. Compared with the SMRs, the CMRs exhibited higher levels of both methylation and expression throughout the developmental process. Moreover, the methylation levels of SMRs displayed a gradual reduction from P7 to P60, while their expression levels changed in the opposite direction (Fig. 2c and Additional file 1: Figure S2b–c). Given the different distribution between ON and OFF switches (Fig. 1c and Additional file 1: Figure S1h), we further analyzed the distribution of m6A peaks in continuously and temporal-specifically methylated mRNAs. In the mouse cerebellum of P7, the temporal-specific m6A peaks were significantly enriched at stop codon regions, while the P60-specific m6A peaks were mostly enriched in start codon regions. 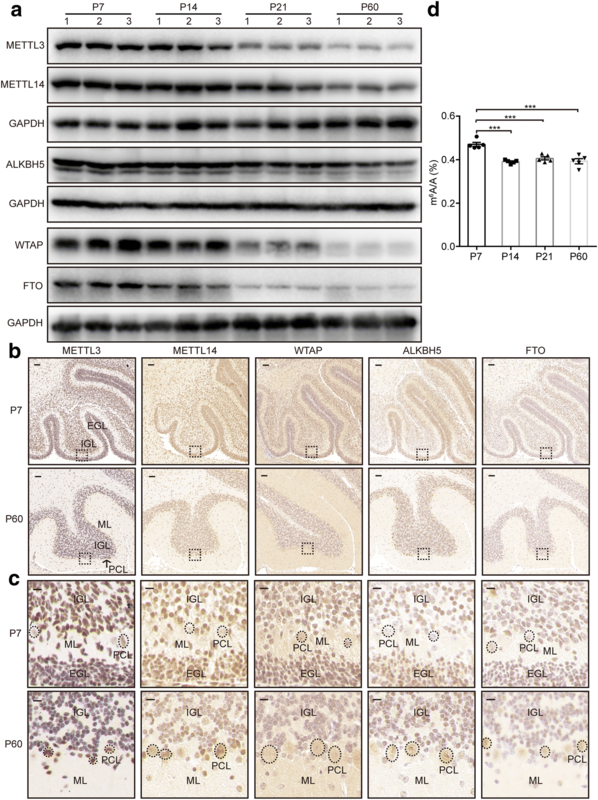 The P14- or P21-specific m6A peaks displayed an apparent transition from stop codon to start codon during progression of cerebellar development (Fig. 2d). Furthermore, we quantified the numbers of temporal-specific m6A peaks located in the five regions of mRNA transcripts. From P7 to P60, we observed a sharp increase in the numbers of temporal-specific m6A peaks in start codon regions, as well as a decrease in the CDS and stop codon regions (Additional file 1: Figure S2d). To ensure that these changes were real rather than artifacts, we randomly extracted the same numbers of CMR peaks as those of temporal-specific peaks and repeated the distribution analysis. Unlike the temporal-specific peaks shown in Fig. 2d, these CMR peaks displayed similar distribution patterns from P7 to P60 (Additional file 1: Figure S2e). The majority of cells in the cerebellum of P7 are proliferating and immature, while the cells in the cerebellum at P60 are fully differentiated. To confirm that such a dynamic distribution pattern was related to the cell states, we compared the RNA methylation profiles in mouse cerebellum at P7 and P60 directly using the peaks identified by exomePeak. Although the proportion of m6A peaks located in CDS were similar between the two stages, we observed a higher percentage of P7-specific m6A peaks near stop codon regions, but a higher percentage of P60-specific m6A peaks in start codon regions (Additional file 1: Figure S2f). These data show that for those temporal-specifically methylated RNAs, the patterns of m6A deposition onto RNA exhibit significant changes along with the progression of cerebellar development. To explore the functional significance of temporal-specific methylation, we next performed GO analysis for those genes with continuous or temporal-specific methylation. In line with the progression of cerebellar development, the four groups of genes containing temporal-specific m6A marks were annotated to different biological processes (Fig. 2e and Additional file 3: Table S5). Genes with P7-specific methylation (such as Aspm in Fig. 2b) were enriched in processes such as cell cycle, cell division, and DNA damage response, which are prerequisites in proliferating neural cells. In contrast, many genes displaying P60-specific methylation (such as Glra1 in Fig. 2b) were annotated to biological processes including transport, oxidation-reduction process, and metabolic processes, which are required for mature neuronal activities. In agreement with their diverging biological functions, the genes with temporal-specific methylation were also characteristic of their distinct cellular localization (Fig. 2f). In contrast, genes encoded by the P7 and P60 CMRs exhibited high similarity in their annotation of enriched biological processes and cellular components (Additional file 1: Figure S2g and Additional file 3: Table S5). Together, these results suggest that the majority of genes with continuous methylation play a fundamental role throughout cerebellar development, while temporal-specific methylation only occurs at specified times for those genes, thus ensuring the proper progression of cerebellar development in a temporal-dependent manner. In parallel to the methylation analysis using the m6A peaks identified using exomePeak, we re-analyzed the m6A-seq data at P7 and P60 using another canonical peak-calling algorithm, MACS2. The P7 SMRs, P60 SMRs, and CMRs exhibited distinct features in their relative methylation levels, distribution patterns of the m6A peaks, and their functional annotations (Additional file 1: Figure S3 and Additional file 4: Table S6). The very high similar results from the two sets of independent analysis further strengthened our awareness of the importance of temporal specific m6A methylation during mouse cerebellar development. We then evaluated how the RNA methylation impacted on gene expression. When each sample was analyzed individually, RNA methylation and expression levels at the global scale were negatively correlated with each other (Additional file 1: Figure S4a). Next, pairwise comparison of RNA expression between each two adjacent stages identified a total of 2451 (P value < 0.05) differentially expressed RNAs throughout development (Additional file 1: Figure S4b), among which approximately 90% were validated by another parallel differential expression analysis using a STAR/edgeR package. Cluster analysis of all expressed RNAs from P7 to P60 produced six clusters of gene expression patterns (Additional file 1: Figure S4c), among which 839 RNAs showed either positive (674) or negative (165) correlation between methylation and expression levels across the four stages (Additional file 5: Table S7). Results of the cluster and subsequent GO analyses suggest that for these RNAs, m6A participates in the developmental control of the mouse cerebellum through modulating their gene expression (Additional file 1: Figure S4d, e). To gain insights into how the dynamic m6A methyl marks are regulated during cerebellar development, we analyzed the protein expression profiles of three m6A writers (METTL3, METTL14, and WTAP) and two m6A erasers (ALKBH5 and FTO). All five proteins were highly expressed at the early stage of cerebellar development (P7) and showed a gradual reduction towards the maturation of cerebellar neurons (P60) (Fig. 3a). Given the spatiotemporal specificity of gene expression in the brain, we performed immunohistochemical staining to detect their expression in situ. In the cerebellum at P7, all five proteins were detected in the external granule cell layer (EGL), Purkinje cell layer (PCL), and inner granule cell layer (IGL); however, their expression levels varied among different types of cells (Fig. 3b). Furthermore, along with the progression of cerebellar development, we observed a reduction of their expression levels in internal granular layers but an elevation in Purkinje cells (Fig. 3c). In agreement with the dynamic expression of the m6A-related proteins, the global m6A levels of poly(A) RNA also decreased from P7 to P60 (Fig. 3d). The highest m6A level at P7 suggests that m6A methylation plays an important role at the earlier developmental stage. To confirm this, we reduced local m6A levels in the developing cerebellum (P7) by knocking down Mettl3 using lentivirus system and examined the consequent morphological changes (Fig. 4a–d). Purkinje cells in the control group displayed an orderly alignment along the outer surface of IGLs with dendritic arborization. However, knockdown of Mettl3 resulted in a severe alteration in Purkinje cell numbers and laminal structure and and stunted dendrites (Fig. 4e). 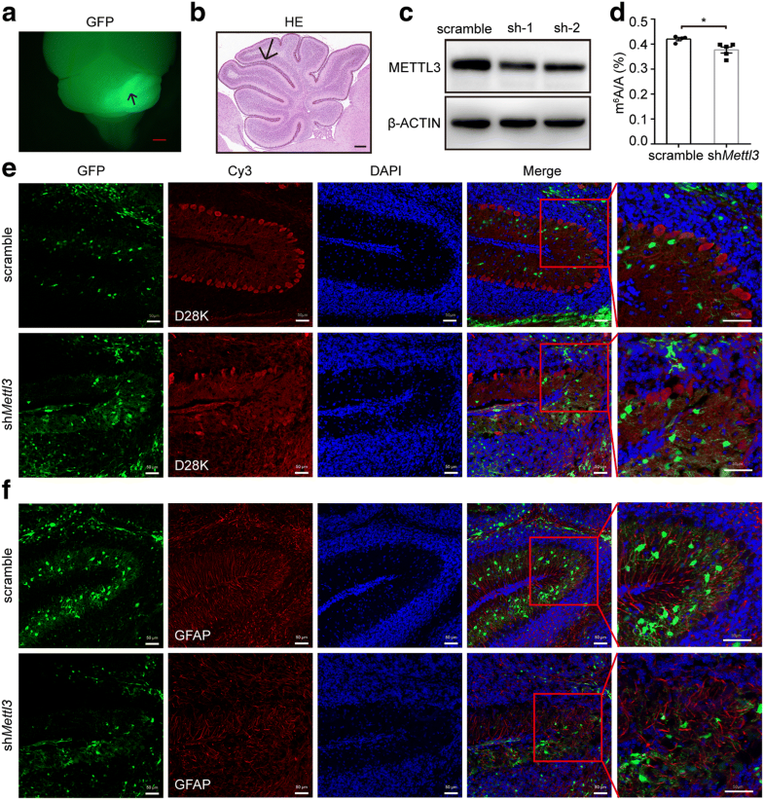 Moreover, GFAP immunostaining revealed that glial cell fibers were severely disorganized in Mettl3-knocked down regions (Fig. 4f). We also examined the effect of Mettl3 overexpression on cerebellar development (Additional file 1: Figure S5a, b). Although the global m6A levels increased modestly (Additional file 1: Figure S5c), overexpression of Mettl3 led to apparent morphology changes, as was observed in the Mettl3-knocked down cerebellum (Additional file 1: Figure S5d-S5e), suggesting that appropriate m6A levels are crucial for cerebellar development. Given the spatiotemporal expression of ALKBH5 in the mouse cerebellum, we next tested its role in cerebellar development. Compared to that of wild-type (WT) mice, the cerebellum of Alkbh5-knockout (KO) mice lacked any detectable changes in weight and morphology (Additional file 1: Figure S6). Considering the potential functions of FTO and other undefined demethylases in the cerebellum, we speculated that this phenomenon was likely due to genetic redundancy and a compensatory response . To overcome these compensatory mechanisms, we made use of the fact that the mammalian brain is sensitive to neuronal damage by hypoxia , while ALKBH5 is unique among the ALKB families in its response to hypoxia stimulation . Therefore, we challenged the mice to extreme physiological conditions in order to exhaust the potential compensatory mechanisms. We propose that ALKBH5 might be involved in the protective mechanism of the brain against damage caused by hypoxia. To confirm this, WT and KO mice were exposed to hypobaric hypoxia for 48 h. We found that in KO mice the sizes of the whole brain and the cerebellum were significantly reduced compared to their littermate controls (Fig. 5a, b). Immunostaining analysis revealed a significant increase in the numbers of Ki67+ proliferating cells and phospho-histone 3 (PH3+) mitotic cells in the EGL compared to the WT counterparts (Fig. 5c, d). Consistently, we also detected an increase in the number of cells in the S phase of the cell cycle (positive BrdU immunoactivity) in the cerebellum of KO mice (Fig. 5e). Furthermore, the number of mature neurons in the IGL of Alkbh5-deficient cerebellum was significantly reduced as reflected by NeuN immunostaining (Fig. 5f). These data suggest that Alkbh5 deficiency disrupted the normal progression of granular neurons from proliferation to differentiation. In addition, we found that Alkbh5 deficiency considerably reduced dendritic arborization of Purkinje cells (Fig. 5g), concomitant with an increase in disorganization of the radial fibers in glial cells (Fig. 5h). Following hypoxic treatment and return to normoxic conditions, we examined the cerebellar sections again at another stage (P14). The internal granule neurons, Purkinje cells, and glial cells exhibited no visible difference between WT and KO mice (Additional file 1: Figure S7a–c). However, we could still observe a slight increase in the numbers of proliferating granule cells as indicated by Ki67 and PH3 immunoreactivity (Additional file 1: Figure S7d, e). In addition, the cerebellum in Alkbh5 KO mice remained smaller than that of the littermate controls (Additional file 1: Figure S7f). 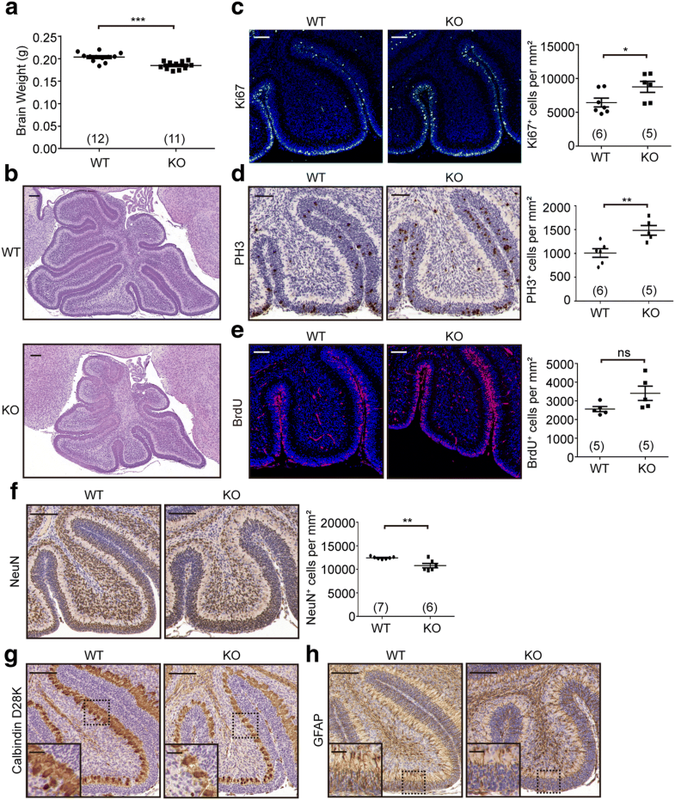 These data indicate that in spite of the undefined compensatory response to partially recover the morphology changes, Alkbh5 deficiency had a profound and deleterious effect on cerebellar development under hypoxic conditions. Together, the abnormal cerebellar development resulting from either ectopic expression of Mettl3 or Alkbh5 deficiency demonstrates that proper orchestration of the spatiotemporal expression of m6A writers and erasers is necessary for mouse cerebellar development. To examine how Alkbh5 deficiency affects m6A methylation of the cerebellar poly(A) RNA, we first performed UHPLC-MS/MS analysis on the poly(A) RNA from cerebella at P7 and found a slight increase in the global m6A levels in the KO mice exposed to hypobaric hypoxia (Additional file 1: Figure S8a). To gain more detailed insight into the epitranscriptome-wide changes of all methylated RNAs, we performed m6A-seq using the poly(A) RNAs from both WT and KO mice exposed to hypobaric hypoxia (Additional file 1: Table S1). A slight increase in the number of m6A peaks and methylated RNAs was observed in the cerebella of KO mice (Additional file 1: Table S2), as well as higher enrichment scores of m6A peaks (Fig. 6a). In addition, we identified 1348 poly(A) RNAs with gain of methylation and 711 poly(A) RNAs with loss of methylation in KO mice cerebellum (P7) (Fig. 6b; Additional file 1: Figure S8b, c). By comparing those abnormally methylated RNAs to the SMRs during cerebellar development of the WT mice, we found that upon Alkbh5 deficiency, 53 original P7 SMRs lost their methylation, while 42 original P14 SMRs, 53 P21 SMRs, and 104 P60 SMRs became methylated at P7. In addition to the gain- and loss-of-methylation RNAs, we also identified a considerable number of RNAs exhibiting a significant increase (514) or decrease (81) in their methylation levels (Fig. 6b). Therefore, in spite of a mild increase of m6A at the global level, Alkbh5 deficiency led to disordered m6A levels of thousands of RNAs. We next performed GO analysis to evaluate whether the defective cerebellar development in KO mice resulted from imbalanced m6A methylation (Fig. 6c, d and Additional file 1: Figure S8e). Partial or complete loss of methylation mainly occurred to the genes participating in the control of cell division (such as Cenpe in Additional file 1: Figure S8c), cell cycle (such as Cdca2 in Additional file 1: Figure S8d), and cell projection organization (such as Erbb4 in Additional file 1: Figure S8d). In contrast, the hypermethylated RNAs were found to be related to metabolic processes (such as Ccr5 in Additional file 1: Figure S8c), ion transport (such as Camk2g in Additional file 1: Figure S8d), and axon guidance (such as Rora in Additional file 1: Figure S8d). Previous studies showed that ALKBH5 regulates RNA nuclear export via an m6A-dependent manner. We therefore asked whether the changes in m6A methylation resulting from Alkbh5 deficiency also affect the RNA nuclear export in vivo. Based on functional enrichment analysis, we chose several genes in different functional pathways, such as cell division (Mphosph9) , membrane potential (Opa1) , microtubule cytoskeleton organization (Wdpcp) , and ion transport (Letm1) , for further investigation. We first conducted gene-specific m6A qPCR assays to validate the increased m6A levels of these four mRNAs in the cerebellum of KO mice (Fig. 6e). Subsequently, subcellular fractionation analysis of cerebellar cells was performed (Additional file 1: Figure S8f, g). Compared to WT mice cerebellum, all the four RNAs invariably exhibited increased abundance in the cytoplasm in the Alkbh5 deficient cerebellum (Fig. 6f). Together, these data indicate that Alkbh5 deficiency led to dysregulated RNA nuclear export in the cerebellum. Given the role of m6A in regulating RNA stability, we also analyzed the gene expression changes resulting from Alkbh5 deficiency. Among the 497 differentially expressed RNAs, 81 exhibited changed methylation and were enriched in functional pathways, including transport, cell division, and cell cycle control (Additional file 6: Table S8). For instance, the genes involved in cell cycle control, such as Ddx11, Ccnb1, and Cbx1, displayed a reduction in their RNA expression together with their reduced methylation. For genes associated with transport or metabolism, Alkbh5 deficiency-induced RNA hypermethylation led to either a decrease (such as Cacna2d3, Notch3, and Jam3) or increase (such as Slc6a20a, Dlk1, Slc2a4, and Ascl2) in their RNA expression in the cerebellum (Additional file 1: Figure S8h). Taken together, our data confirm that, by altering the original m6A level, Alkbh5 deficiency disturbed the RNA metabolism of a subset of cell fate determination genes and thus led to defective cerebellar development in the mice exposed to hypobaric hypoxia. Brain development is known to be regulated in a precise spatiotemporal manner. We have recently identified region-specific m6A with distinct methylation patterns and biological functions for the mouse cerebellum and cerebral cortex . In the present study, we further demonstrate that developmentally regulated m6A methylation is one of the important regulatory factors for postnatal mouse cerebellar development. 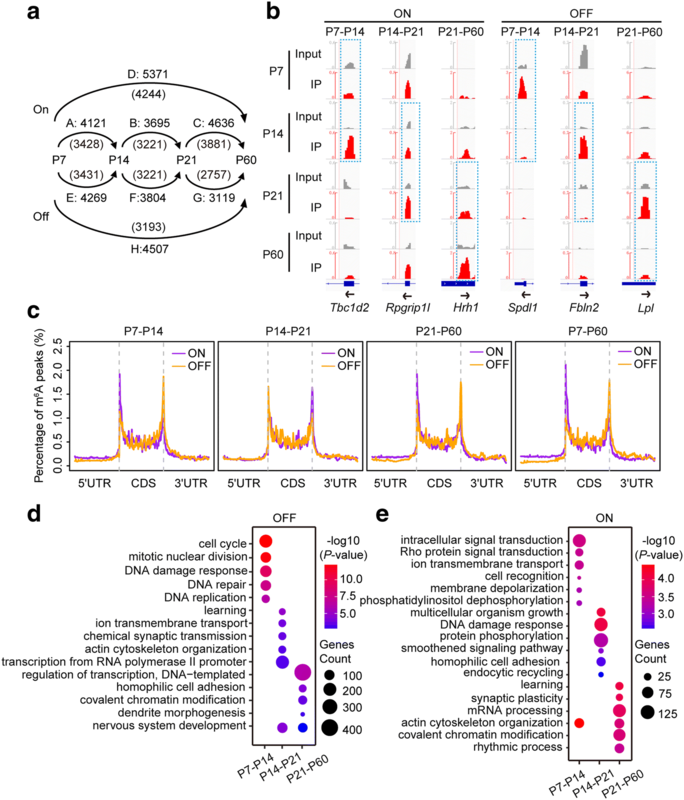 Temporal-specific methylation differs from continuous methylation in its methylation level, biological functions, and dynamic distribution of m6A marks. Furthermore, we uncovered that abnormal expression of m6A methyltransferases (METTL3) and demethylases (ALKBH5) caused imbalanced RNA methylation, which further led to defective cerebellar development. We also discovered that Alkbh5 deficiency led to facilitated nuclear export of those hypermethylated RNAs. Previous identified changes in genome-wide gene expression and epigenetic modifications throughout the whole cerebellar developmental processes have greatly improved our understanding of the mechanism related to mouse cerebellar development [34, 35, 44]. Given the role of m6A in fate determination of embryonic stem cells and mammalian cortical neurogenesis [16, 17, 31, 45], we hypothesized that m6A also participates in neuronal cell proliferation and differentiation in the mouse cerebellum. In this study, we show that a considerable number of RNAs in the mouse cerebellum exhibit developmentally regulated methylation. GO analysis implied that numerous genes regulating cell proliferation, differentiation, or metabolism acquire m6A marks in a temporal-specific manner, among which the expression of 839 RNAs was under tight regulation by their methylation status. Notably, we found that the number of differentially methylated RNAs is much higher than that of differentially expressed RNAs as observed during cerebellar development and in Alkbh5 KO mice. We speculate that this is probably due to the additional functions of RNA methylation in RNA splicing, nuclear export, and protein translation . For example, although the hypermethylated RNAs presented in Fig. 6e did not change in their expression levels, their nuclear export was enhanced by Alkbh5 deficiency. Since it is the transcripts in the cytoplasmic pool that are utilized for RNA translation to protein and RNA degradation, appropriate m6A levels are necessary for maintaining RNA nuclear export in a balanced state. 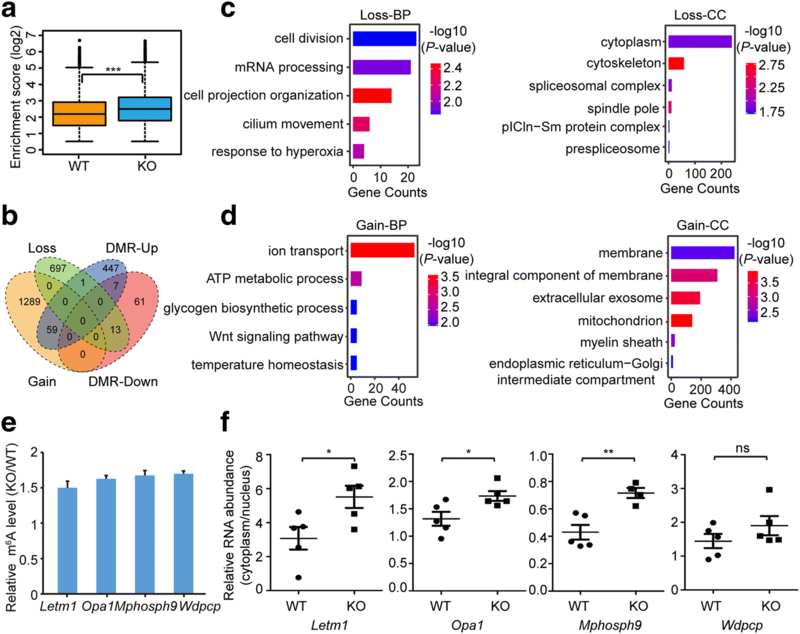 These results imply that the selective m6A marks, through their various modulatory effects on RNA processing, function as epitranscriptomic switches that either activate or suppress a series of physiological events during mouse cerebellar development. In line with our findings in the mouse cerebellum, dynamic changes in m6A RNA methylation were also observed during postnatal liver development in pig  and mouse spermatogenesis . The dynamic RNA methylation levels in the developing cerebellum reveal how important it is to maintain the balance of RNA methylation in the developing mouse cerebellum, which is accomplished by both the m6A methyltransferases and demethylases. The morphological changes observed upon transient knockdown or overexpression confirm that METTL3 is involved in regulating cerebellar development. In addition to methyltransferase, RNA m6A demethylase is another important factor to maintain RNA methylation at appropriate levels. The important role of FTO in the mouse cerebellum was shown in a previous report using a Fto-knockout mouse model, which is characterized by a cerebellum that is significantly smaller than that in WT litter mates . ALKBH5, another demethylase identified earlier, regulates spermatogenesis  and maintains tumorigenicity of glioblastoma stem-like cells . However, its function in the brain remains unclear. Here we only observed defects in cerebellar development in Alkbh5-deficienct mice upon exposure to hypobaric hypoxia. It is likely that ALKBH5, FTO, and probably other undefined demethylases overlap in their demethylation activity and can partially substitute for each other’s functions under normal conditions . On the other side, our results also reveal the distinct functions between ALKBH5 and FTO. In line with a previous report , we provide in vivo evidence that ALKBH5 regulates the nuclear export of the hypermethylated RNAs, while FTO regulates RNA splicing in a methylation-dependent manner . In this study, we observed increased cell proliferation in the Alkbh5-deficienct mouse cerebellum exposed to hypobaric hypoxia. In contrast, Fto deficiency in adult mouse hippocampus led to reduced cell proliferation in adult neural stem cells . The discrepancy in these results confirmed that RNA methylation constitutes a complex process and suggests that the regulation and function of m6A methylation in the mouse brain should be investigated in a more precise spatiotemporal-dependent manner. In the WT mouse cerebellum at P7, the m6A modification selectively marked a group of RNAs responsible for cell cycle control and cell division. In Alkbh5 KO mice exposed to hypobaric hypoxia, we detected many of these types of RNAs with aberrant methylation, which may further disturb RNA metabolism, such as RNA splicing, nuclear export, RNA decay, or translation. In agreement with these findings, we observed an increase in the numbers of mitotic cells in the cerebellum of Alkbh5 KO mice upon exposure to hypobaric hypoxia. Mechanistically, we showed the hypermethylation and enhanced nuclear export of Mphosph9, which encodes a centrosomal protein related to cell division and cell cycle control . Therefore, abnormal RNA methylation is likely one of the reasons resulting in dysregulated cell proliferation and cell cycle progression observed in the Alkbh5-deficient cerebellum. Consistent with our findings, deficiency in the m6A reader Ythdf2 delayed DNA synthesis and mitotic processes in a zebrafish model . In another study, deletion of Mettl14 in embryonic mouse brain also led to prolonged cell cycle of cortical neural progenitors . Together, these phenotypes provide strong evidence that balanced m6A levels are essential for cell cycle control. Moreover, we found that a higher number of RNAs were hypermethylated in Alkbh5-deficient cerebella of P7, which were originally methylated only in fully differentiated, mature neural cells in WT cerebellum. Such untimely and aberrant methylation finally appears to result in premature differentiation and aberrant neurogenesis in the cerebellum. This may explain the phenotypes of lower numbers of mature granule neurons in IGLs, together with disorganized Purkinje cells, and astrocytes. Generally, cell fate determination requires a burst of expression of a distinct group of genes at each specified stage, which is spatially and temporally regulated throughout the whole developmental process. Our results show that the positive or negative regulation of m6A marks on these cell fate-determining genes is important to drive the proper progression of postnatal cerebellar development. Different from previous in vitro analysis showing that m6A marks are predominantly located near stop codons and 3′ UTRs, previous in vivo methylation analysis of mouse cerebellum and cerebral cortex identified the m6A marks in start codon regions as well as stop codons and 3′ UTRs . Here, we identified similar patterns of m6A distribution throughout the process of postnatal cerebellar development. Importantly, we observed a significant change in the distribution of temporal-specific m6A marks from P7 to P60. 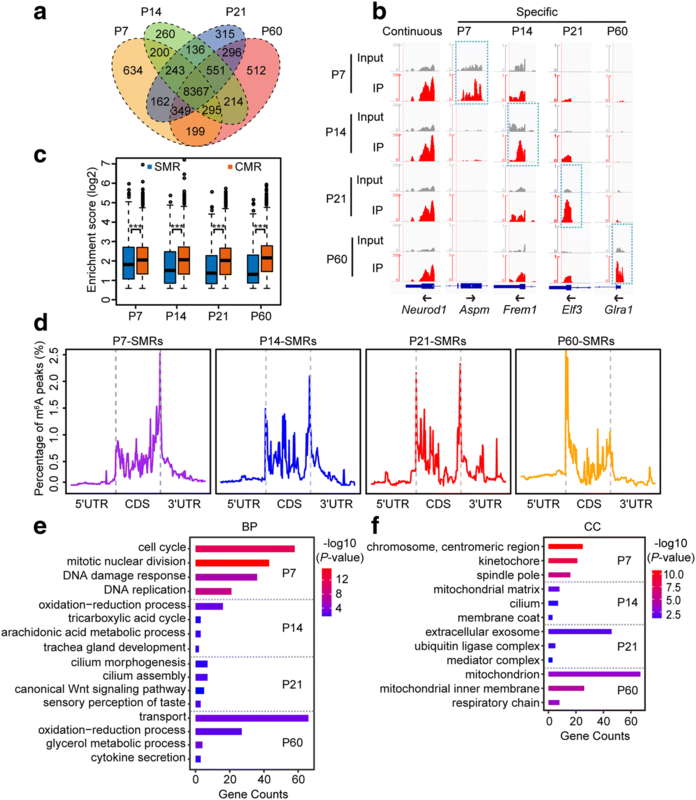 We deduce that the distribution patterns of temporal-specific m6A peaks possibly reflect the difference in methylation sites between proliferating, immature and fully differentiated, mature neural cells. In the mouse cerebellum of P7, during which the majority of neural cells are actively proliferating, the temporal-specific m6A peaks were enriched in CDS, stop codons, and 3′ UTRs, which was similar to the results obtained from the m6A-seq analysis performed using cell lines [2, 3, 48]. In contrast, distribution of temporal-specific m6A peaks in start codon regions was most significant in mouse cerebellum at P60, which mainly consists of well-differentiated and mature neural cells. In support of our findings, m6A marks in start codon regions were also observed in the fully differentiated tissues from mouse cerebral cortex  (unpublished data), A. thaliana , rice , liver , and muscles . Collectively, these data imply that the methylation in start codon regions occurs not only in mature neural cells of the mouse cerebellum, but also in many other types of fully differentiated cells in diverse organisms. We thus propose that the position of m6A marks included in the transcript may be an important factor that determines the functions mediated by m6A. Further investigation will be necessary to clarify the precise roles of m6A in different physiological processes. However, the m6A-IP-seq used in this study was unable to identify the exact position of the m6A marks. We cannot rule out the possibility that the m6A marks located in 5′ UTR may be misclassified into start codon regions for those poly(A) RNAs with a very short 5′ UTR. Thereby, single nucleotide-resolution m6A analysis [48, 52] should be utilized next to identify the exact positions of m6A marks, which will further enable exploration of the functions and regulatory mechanism of m6A deposited in different regions of the transcripts. In addition, the different patterns of m6A observed between cell lines and tissues indicates the complexity of in vivo temporal regulation of RNA methylation, suggesting the necessity to characterize RNA methylation in a context-dependent manner. Gene regulation in the brain is characterized by its considerable cellular heterogeneity, including gene expression , DNA hydroxymethylation , and m6A RNA methylation . Accordingly, we found that during cerebellar development, the expression of m6A writer and eraser genes in granule neurons and Purkinje neurons changed in opposite directions. Although the poly(A) RNAs analyzed in this study were isolated from a mixture of all neural cell types in the mouse cerebellum, the methylation profiles depicted here mainly reflect the nature of m6A modification in granule neurons as they constitute about 90% of the cerebellar neural cells . For further insights, it will be important to elucidate the methylation profiles and related biological functions in Purkinje cells and glial cells, respectively. A more detailed, cell type-specific methylation analysis will be necessary to gain insights into the biological functions and developmental regulation of m6A modification in individual types of neural cells. Here, we describe the first m6A RNA methylation landscape during postnatal development of the mouse cerebellum and reveal the unique features of continuously and temporally specific methylation in the mouse cerebellum from P7 to P60. Our results indicate that temporal regulation of RNA m6A methylation, orchestrated by spatiotemporal expression of m6A writers and erasers, is essential in regulation of postnatal cerebellar development. We also provide the first in vivo evidence that ALKBH5-induced abnormal RNA methylation affects RNA nuclear export. Further studies will be necessary to uncover the detailed molecular mechanism of the regulation and biological functions of m6A during mouse cerebellar development. In addition, characterization of the role of m6A in the cerebellum will offer a new viewpoint to elucidate the mechanism of related neurological diseases. Wild-type C57BL/6 mice were purchased from Vital River company (Beijing, China). The Alkbh5-deficient mice were used and genotyped as described previously . For all experiments performed here, equal numbers of male and female mice were included for analysis. All animal experiments and euthanasia were approved and performed in accordance with the guidelines of Animal Care and Use Committee of IBMS/PUMC. The IRB (Institutional Review Board) approval number is ACUC-A02–2014-001. Neuro2a cells and HEK293T cells were purchased from National Infrastructure of Cell Line Resource (Beijing, China). The cell lines have been authenticated and tested for mycoplasma contamination by the provider. Detailed information on the primary and secondary antibodies used in this study is listed in Additional file 1: Table S9. Mice were sacrificed by cervical dislocation and cerebellum was removed and immediately snap-frozen in liquid nitrogen. Total RNA was extracted using TriReagent (Sigma, T9424) according to the manufacturer’s instructions. In general, four mice of P7, four mice of P14, and three mice of P21 or P60 were used for one m6A-IP reaction according to the established protocol . Briefly, poly(A) RNA was purified from total RNA using Poly(A)Purist™ MAG Kit (Thermo Fisher, AM1922). Next, poly(A) RNA was fragmented to 100-150 nucleotides (for m6A-seq) using RNA Fragmentation Reagents (Thermo Fisher, AM8740) as instructed by the manufacture. Fragmented poly(A) RNA (1 μg) was incubated with 2.5 μg of anti-N6-methyl-adenosine antibody at 4 °C for 4 h, followed by addition of Dynabeads™ Protein A for Immunoprecipitation (Thermo Fisher, 10002D). After incubation at 4 °C for 2 h, beads were extensively washed five times with IPP buffer (150 mM NaCl, 0.1% NP-40, 10 mM Tris-HCl, pH 7.4); immunoprecipitated RNA was recovered through elution with m6A nucleotide followed by ethanol precipitation. For m6A-seq, a cDNA library was constructed using a KAPA Stranded mRNA-seq kit (Kapa Biosystems, KR0960) and subjected to next-generation sequencing on an Illumina Hiseq X Ten system. Input RNA before immunoprecipitation was applied to RNA-seq in parallel. For gene-specific m6A-IP-qPCR, m6A-IP was performed using 3 μg of fragmented poly(A) RNA (300–500 nucleotides). Reverse transcription was carried out with an equal ratio of RNA from input and IP product by using ReverTra Ace® qPCR RT Master Mix (TOYOBO, FSQ-301). Quantitative real-time PCR was performed by using THUNDERBIRD™ SYBR® qPCR Mix (TOYOBO, QPS-201). Gapdh was used as a negative control. The primers used in this study are listed in Additional file 1: Table S10. Cerebella were dissected from mice of different ages and triturated in RIPA lysis buffer with protease inhibitor cocktail (Roche, 04693159001) and phosphatase inhibitors. Tissue lysate (60–80 μg) was subjected to 10% SDS-PAGE. After electrotransfer, the blots were blocked in 5% milk in Tris-buffered saline with Tween 20 (TBST) for 1 h at room temperature, then incubated at 4 °C overnight with the primary antibodies. The transferred membranes were incubated with appropriate HRP-conjugated secondary antibodies, exposed to enhanced chemiluminescence (ECL) solution, and visualized by gel image analysis system (Tanon, 5800). After anesthesia with saturated tribromoethanol solution, mice were perfused with 4% paraformaldehyde; the whole brains were dissected and post-fixed in 4% paraformaldehyde for 24–48 h at 4 °C. For paraffin sections, the cerebellum was dehydrated with ethanol, clarified with xylene, and then embedded in paraffin. We used 4-μm-thick sections for hematoxylin and eosin (H&E) staining or immunohistochemistry analysis. For cryosections, the cerebella were dehydrated in 30% sucrose for more than 24 h, embedded in OCT compound and frozen at − 40 °C. We used 12-μm-thick sections for immunofluorescence analysis. Immunohistochemistry and immunofluorescence staining were performed according to standard protocols . For BrdU incorporation analysis, the mice were intraperitoneally injected with BrdU (Sigma, B5002; final concentration 50 μg/g) and analyzed 2 hours after BrdU injection. Immunofluorescence analysis was performed as described above by using anti-BrdU antibody. Images of H&E and immunohistochemical staining were recorded using a Panoramic MIDI II digital slide scanner (3D Histech). Results of immunofluorescence analysis were imaged with a confocal microscope (Zeiss, LSM780). The absolute amount of m6A in the poly(A) RNA was measured as described before . Briefly, 100 ng of poly(A) RNA was digested with nuclease P1 (Sigma) at 37 °C for 2 h, followed by treatment with calf intestine alkaline phosphatase (CIAP, Promega) at 37 °C for 2 h. The solution was filtered and analyzed using ultra-performance liquid chromatography and a triple-4 quadrupole mass spectrometer (AB SCIEX QTRAP 5500). m6A level in each sample was calculated by comparing with the standard curve obtained from pure nucleoside standards loaded simultaneously. The ratio of m6A to A was calculated to obtain the global methylation level. The lentiviral overexpression vectors used in this study include pLV-EF1a-EGFP(2A) Puro, pH 1, and pH 2 vectors (kindly provided by Prof. Kaili Ma). cDNA of mouse Mettl3 was cloned into pLV-EF1a-EGFP(2A) Puro vector digested with EcoR I and BamH I restriction enzymes. The overexpression efficiency of lentivirus was verified in Neuro2a cells by western blotting. The primers used were: forward, 5′-cggaattc ATGTCGGACACGTGGAG-3′; reverse, 5′- cgggatccCGCTATAAATTCTTAGG-3′. The lentiviral knockdown system used in this study includes pLL3.7, pRSV-rev, pMDLg/pRRE, and pCMV-VSV-G (kindly provided by Prof. Qi Xu). shRNA of mouse Mettl3 was cloned into pLL3.7 vector between HpaI and XhoI restriction enzyme sites. Two sets of shRNAs were used for each gene and were evaluated for their knockdown efficiency in Neuro2a cells via western blot analysis. The shRNA with higher efficiency was chosen for subsequent in vivo virus infection of mouse cerebellum. The oligos of Mettl3 shRNA were: 1, 5′-aaccGCACACTGATGAATCTTTAGGTtcaagag ACCTAAAGATTCATCAGTGTGCtttttc-3′; 2, 5′-aaccCTGCAAATATGTTCACTATGAtcaagag TCATAGTGAACATATTTGCAGtttttc-3′. The negative control containing scrambled shRNA was 5′-aaccTTCTCCGAACGTGTCACGTtcaagagACGTGACACGTTCGGAGAAtttttc-3′. The plasmids generated here were written in short as OE, sh-1, sh-2. All lentivirus vectors were purified and amplified using QIAGEN Plasmid maxi kit (Qiagen, number 12163). 293 T cells were co-transfected with a mixture of lentiviral plasmids (including 17.5 μg of pLV-derived plasmid, 13.125 μg of pH 1, 4.375 μg of pH 2 for overexpression system; 14 μg of pLL3.7-derived plasmid, 7 μg of pMDLg/pRRE, 7 μg of pCMV-VSV-G, 7 μg of pRSV-Rev for knockdown system) using DNA transfection reagent (Neofect, TF20121201). Ssupernatants were collected 48 h after transfection and concentrated by ultracentrifugation. Titration of lentivirus was carried out by transducing 293 T cells in tenfold serial dilution. Generally the lentivirus used in this study had a titer of 1 × 108 to 1 × 1010 TU/ml. In vivo lentivirus infection was performed as previously described with minor modification . Briefly, wild-type C57BL/6 mice (P7) were anesthetized on ice and then injected with a mixture of lentivirus (2 μl), polybrene (800 ng/μl), and fastgreen (0.1%) into the interlobular space between lobules V and VI. Pups were revived at 37 °C and then returned to original cages. After 7 (for overexpression) or 10 (for knockdown) days post-lentivirus infection, immunofluorescence analysis was performed as described above to detect the phenotypes of cerebellum upon lentivirus infection. WT or Alkbh5 KO mice of P5, together with their mothers, were placed into a hypobaric hypoxic chamber and exposed to a simulated atmospheric pressure of 10.6 kPa (377 mmHg), which was equivalent to an altitude of 5500 m. All animals were kept at constant temperature (25–30 °C) on a daily light schedule of 12 h of light vs. dark with normal activity. The hypobaric hypoxic condition was maintained and monitored continuously with the sensor inside the chamber. Wild-type and Alkbh5−/− pups were dissected for phenotype analysis after incubation in the hypobaric chamber for 48 h. To examine the phenotypes of hypoxia-treated mice at later developmental stages, the WT and KO mice were returned to normoxic conditions together with their mothers and raised for another 7 days before dissection for phenotype analysis. Mice were anaesthetized with 0.75% amobarbital before analysis. Mouse brain MRI was performed on a 7.0 T BioClinscan Animal MRI System (Bruker, Germany) with Siemens manipulating software. T2-weighted images of the whole brain (including the sagittal, coronal, and transverse views) were acquired with a 2D-TSE (2D-turbo spin-echo) sequence. The scanning time for each mouse was about 10 min. The scanning parameters were as follows: sagittal view, TR = 2360 ms, TE = 41 ms, number of averages = 1, 15 axial slices with a slice thickness (ST) of 0.7 mm, a field of view (FOV) of 3.52 cm × 3.52 cm, and a matrix of 320 × 320 were positioned over the whole brain with a pixel spacing of 0.11 mm; coronal view, TR = 3510 ms, TE = 53 ms, number of averages = 1, axial slices = 19, ST = 0.5 mm, image matrix size = 320 × 384, pixel spacing = 0.078 mm, FOV 2.50 cm × 3.00 cm; transverse view, TR = 3380 ms, TE = 41 ms, number of averages = 1, axial slices = 21, ST = 0.7 mm, image matrix size = 320 × 320, pixel spacing = 0.094 mm, FOV 2.82 cm × 2.82 cm. Then the signals of different brain regions were measured and compared using a RadiAnt DICOM Viewer. Fresh cerebella of WT and KO mice at P7 were minced and incubated in Digestion Solution (30 U/mL papain, 240 μg/mL cystein, 400 μg/mL DNAse I type IV) at 37 °C for 1 h. The reaction was stopped by adding Ovomuccoid inhibitor solution (1125 μg/mL Ovomuccoid trypsine inhibitor, 525 μg/mL BSA, 400 μg/mL DNase I type IV) and incubation at 37 °C for 4 min. After purification, cerebellar cells were subjected to cellular fractionation using a PARIS™ Kit (Thermo Fisher, AM1921) according to the manufacturer’s protocol. Nuclear and cytoplasmic RNAs (120 ng) were reverse transcribed using ReverTra Ace® qPCR RT Master Mix (TOYOBO, FSQ-301). Quantitative real-time PCR was performed using THUNDERBIRD™ SYBR® qPCR Mix (TOYOBO, QPS-201). Nd1 was used as a cytoplasmic marker while U1 was used as a nuclear marker. The primers used in this study are listed in Additional file 1: Table S10. For each sample, single-end reads were used for bioinformatics analysis. Quality control of raw data was done using FastQC software (version 0.10.1). Sequencing data were preprocessed with in-house Perl scripts using the following criteria: 1) adaptor sequence was removed by finding the sequence AGATCGGAAG with at most two mismatched bases; 2) bases with low quality score (< 20) were trimmed off from the 3′ end; 3) reads with length longer than 70 nucleotides and more than 70% bases with quality score > 25 were retained. These high-quality reads were mapped against the mouse genome (mm10) allowing up to two mismatches using TopHat software (version 2.0.13) [57, 58]. Only uniquely mapped reads were kept for the subsequent analysis. The FPKM (fragments per kilobase of transcript per million mapped reads) values of RNAs in each sample were calculated using Cufflinks toolkit (version 2.0.2) . Only the transcripts with FPKM value > 0.2 were considered as expressed transcripts . The differentially expressed RNAs (DERs, P < 0.05) between any two samples were identified using Cuffdiff. The normalized FPKM value for each sample was used for clustering using the KMC method of MeV software with the following parameter settings: 1) Pearson correlation clustering; 2) K-means clustering for six clusters; 3) other parameters set as defaults . To verify the reliability of the DERs, we performed a parallel differential expression analysis by STAR/edgeR packages. High quality reads in each sample were mapped to the mouse genome (mm10) using STAR software and the uniquely mapped reads were kept for the subsequent analysis [62, 63]. HTSeq software  was utilized to calculate the read count of RNAs and edgeR  was applied to identify the DERs (P < 0.05). All software applications were run with default parameters. where ai,j denotes the peak “IP FPKM” value of the ith methylation peak in the IP sample from the jth biological sample; Ai,j denotes the total reads mapped to the ith methylation peak in the IP sample from the jth biological sample; Bj denotes the total unique reads mapped to the mouse reference (mm10) in the IP sample from the jth biological sample; Ci,j denotes the length (base) of the ith methylation peak in the IP sample from the jth biological sample; bi,j denotes the peak “input FPKM” value of the ith methylation peak in the input sample from the jth biological sample; Di,j denotes the total reads mapped to the ith methylation peak in the input sample from the jth biological sample; Ej denotes the total unique reads mapped to the mouse reference (mm10) in the input sample from the jth biological sample; ci,j denotes the peak “enrichment score” value of the ith methylation peak in the IP/input sample from the jth biological sample. M6A peaks that satisfied 1) exomePeak FDR value < 0.05, 2) m6A peak “IP FPKM” value > 1, and 3) m6A peak “enrichment score” value > 1.5 were used for further comparative analysis. The continuously methylated RNAs (CMRs) were defined as RNAs containing at least one m6A peak in all the four samples, while the temporal-specific methylated RNAs (SMRs) were the RNAs with m6A modification only in one sample, and m6A peaks of SMRs were defined as specific m6A peaks. By merging all the m6A peaks of four developmental stages using mergeBed of BEDTools with “-s”, “-c”, and “-o” parameters, we identified “ON” or “OFF” RNA m6A switches during cerebellar development. All m6A peaks absent in the former stage but present in the later stage were called “ON” m6A switches, while all m6A peaks displaying changes in the opposite direction were called “OFF” m6A switches. In addition, the differentially methylated RNAs (DMRs) between wild-type and Alkbh5 knockout mice were further identified using exomePeak software with default parameters, and high-confidence DMR m6A peaks matching the criteria of FDR < 0.05 and log2 (fold change) > 1 or < − 1 were selected for further analysis. For validation analysis of the distribution patterns of stage-specific m6A peaks which were obtained by using the exomePeak software, peak calling analysis was performed in parallel using the MACS2 software for the P7 and P60 samples with the default parameters [54, 70]. The integrative genomics viewer (IGV) tool was used for visualization of m6A peaks along the whole transcript [71, 72]. The heatmaps of the enrichment score for m6A peaks were plotted using the pheatmap package in R .
Distribution of m6A peaks along mRNAs were determined as previously described with minor revision [3, 18]. To characterize the distribution patterns of m6A peaks, a reference mouse transcriptome was built using the longest transcript of each gene. Next, each of the 5′ UTR, CDS, and 3′ UTR regions were split into 100 bins with equal length. The percentage of m6A peaks in each bin was calculated to represent the occupancy of m6A peaks along the whole transcripts. We further counted the number of m6A peaks in the 5′ UTR, start codon region, CDS, stop codon region and 3′ UTR, respectively. Specifically, a 300-nucleotide region centered on start codons or stop codons was defined as start codon regions or stop codon regions . The global clustering analysis of RNA methylation levels (enrichment score) and expression levels (FPKM) among the four stages was performed using Cluster 3.0 software. The enrichment scores and FPKM of each RNA in each sample were adjusted with “mean” parameters in “Normalize genes” and “Center genes”. The hierarchical clustering method was employed using “Complete linkage”. The clustered heatmap figure was generated using TreeView-1.1.6r4-win software. In order to obtain a dynamic view of the regulatory effect of RNA m6A methylation on RNA abundance, we calculated the correlation coefficients and the associated P value between the enrichment scores of m6A peaks and FPKM of methylated RNAs at the four stages using Pearson test in R package. High-confidence regulatory gene pairs were defined by the correlation coefficients (|r| > 0.95) with P value < 0.05. Cluster analysis was performed for those positively (r > 0.95) and negatively (r < − 0.95) correlated RNAs using MeV software, respectively. The MeV cluster results were integrated and plotted using R programming language. The DAVID tool  was used for GO analysis by applying default parameters, except that only those transcripts fulfilling the condition of FPKM > 0.2 in the input samples were set as background. Either bubble plots or column plots were generated based on the enriched GO terms using the ggplot2 in R package . Color intensity indicates the value of −log10(P value), while the length of columns or the size of the circles indicate the gene counts. A full list of all selected terms of the biological process, cellular components, and molecular functions category are provided in Supplemental tables (Additional file 2-4: Table S4-S6; Additional file 6: Table S8). All modified genes were annotated to Kyoto Encyclopedia of Genes and Genomes (KEGG) pathways using KAAS (KEGG Automatic Annotation Server) , and the enriched KEGG pathways for the genes encoded by P7 or P60 temporal-specific SMRs or CMRs were identified using Fisher’s exact test (Additional file 4: Table S6) . The differences in distribution for m6A enrichment score and log2 FPKM between samples were detected by Wilcoxon test. Pearson test was used to perform correlation analysis. All statistical analysis and graphs of results in Figs. 3d, 4d, 5a, 5c–5f and 6f, and Additional file 1: Figures S5c, S6a, S7d, S7e, S8a and S8g were assessed using two-tailed unpaired Student’s t-test and performed using GraphPad Prism 6.0 software. Results are presented as mean ± s.e.m. Immunoreactive cells in 3–5 randomly selected lobules of one cerebellum were counted using StataQuest 5.0 software. For each subject, data were collected from five to seven mice. For each mouse, data were obtained from the immunostaining results of two to three near-midline slices. Chunhui Ma, Mengqi Chang and Hongyi Lv contributed equally to this work. We thank Prof. Xu Q and Dr. Ma K-L for their generosity in offering lentivirus vectors. The datasets have been deposited in the Sequenced Read Archive (SRA) under accession number PRJNA400297 (SRX3136161-SRX3136172) , and also in the Genome Sequence Archive  in BIG Data Center , Beijing Institute of Genomics (BIG), Chinese Academy of Science under accession number CRA000472 . NY and TWM conceived the project and, with SS and KA, designed the data analysis. MC performed phenotype analysis. CM performed m6A-IP and phenotype analysis. LH, ZW and TX performed bioinformatic analyses. ZZW performed lentivirus infection experiments. HX performed mouse brain dissection experiments. WG performed plasmid construction experiments. ZS and ZY assisted with immunostaining analyses. WD assisted with western blot analyses. LC and LQ performed MRI analysis. NY, MC and LH wrote the manuscript with input from all authors. All authors read and approved the final manuscript. All animal experiments and euthanasia were approved and performed in accordance with the guidelines of Animal Care and Use Committee of IBMS/PUMC. The IRB (Institutional Review Board) approval number is ACUC-A02–2014-001. Kolde R: pheatmap. 2015. https://CRAN.R-project.org/package=pheatmap. Published 11 Dec 2015. Chunhui Ma, Mengqi Chang, Hongyi Lv, Yamei Niu, Shuhui Song, Wei-Min Tong, et al: RNA m6A methylation participates in regulation of postnatal development of the mouse cerebellum. SRA PRJNA400297. 2017. https://www.ncbi.nlm.nih.gov/sra/?term=PRJNA400297. Accessed 25 Apr 2018. Chunhui Ma, Mengqi Chang, Hongyi Lv, Yamei Niu, Shuhui Song, Wei-Min Tong, et al: RNA m6A methylation participates in regulation of postnatal development of the mouse cerebellum. GSA CRA000472. 2017. http://bigd.big.ac.cn/search?dbId=gsa&q=CRA000472. Accessed 25 Apr 2018.